A Detailed Process for production of nitrogen from Air. Nitrogen plant based on pressure swing Absorption (PSA) Technology for Continuous process application like Food Packing,Metal Cutting,Inerting etc. 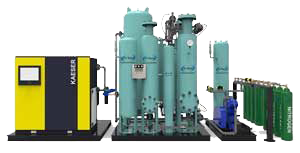 Nitrogen Plant based on pressure swing absorption (PSA) Technology used for charging cylinders/bottles upto high pressure of 3200 PSI. Nitrogen Plant based on pressure swing absorption (PSA) Technology used for charging cylinders/bottles upto high pressure of 3200 PSI for MIlitary Defense & first responders.